If you’ve ever been employed in a commercial kitchen or food preparation area, you know that working with a large variety of heavy duty electrical appliances greatly increases potential hazards. Commercial kitchen employees face an especially high risk of electrocution, as water spills and grease fires can lead to danger without proper electrical safety practices. One of the best ways to protect workers in these hazardous locations is by installing GFCI receptacles. Consequently, National Electrical Code® Article 210.8 requires GFCI protection for all 15 and 20A, 125V receptacles installed in kitchens, even if not readily accessible or on a dedicated branch circuit for a specific cord-and-plug connected appliance. In commercial kitchens most receptacles are often inaccessible, therefore; it’s imperative that they provide visual power-status information that can easily be seen in all lighting conditions. Our new pilot light GFCI receptacles have a high-visibility red LED light and are ideal for personnel protection on dedicated branch circuits. The high intensity power indication pilot light on the device makes it easy for users to determine whether there is power to the receptacle, without having to move equipment to test the device's circuit. 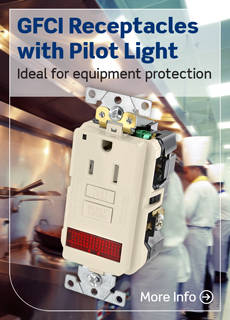 Common applications for the pilot light GFCI include commercial kitchens, vending areas, food preparation areas and manufacturing plants. All units come standard with tamper-resistant shutters to meet the latest National Electrical Code® requirements. Do you have any other safety recommendations to employees working in commercial kitchens? Tell us in the comments! Industrial Grade Receptacles Now Available in Tamper-Resistant Configurations!